Roughly 30 years ago, Michael Futreal was browsing a farmers’ market in North Carolina when he stumbled on a giant dipper gourd. 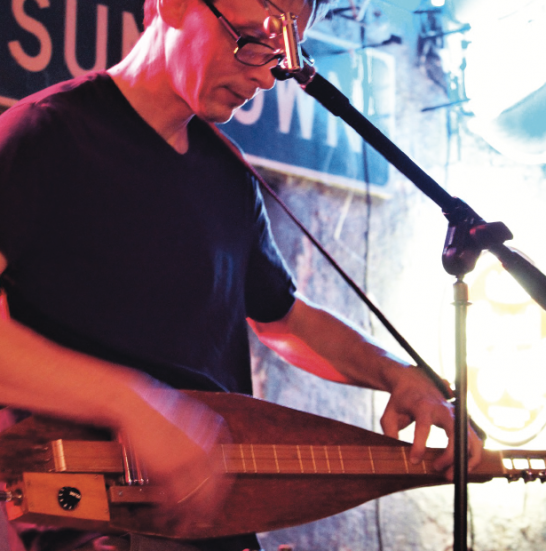 “I knew it was meant to be an instrument,” he says of the three-stringed fabrication that he played at the Tuesday night Critical Mass showcase earlier this month, where he was named Best in Show. He started making the gourd with help from his graduate school adviser at North Carolina State University, where he earned an M.S. in applied sociology in 1996. But he didn’t finish the electric gourd instrument for nearly 20 years, as it required him to build and rebuild an electric dulcimer and install it into the hard-skinned fruit. “Building and rebuilding instruments dovetails nicely with my broader concern that the commodification of creative tools and artworks offers diminishing returns to artists and audiences, pushing them to operate strictly within boxes wrought by marketing schemes,” Futreal says. These days, his music studio includes an array of dulcimers, an acoustic gourd, and several gourd and bamboo flutes. Indeed, there is a woodsy, yet otherworldly quality to his work. Influences run the gamut, from British Isles folk music to West African tradition of stringed instruments to Béla Bartók’s polymodal chromaticism. If that all sounds a little technical, it’s because Futreal has burrowed himself deeply into the wormhole of a very specific form of historical art, while also attempting to redefine it for a new generation. Since 2010, Futureal has performed throughout his adopted state of Louisiana as part of Twang Darkly, which has released several albums of their improvisational musical “contemplations.” He plays with Joel Boultinghouse on guitar and bass and Lane Bayliss on percussion. Last year, the band’s latest release, “Impossible Things,” included the live performance from the public event, New Research in Rural Space Music, which received an artist grant from the Shreveport Regional Arts Council. The composition that won him the $2,000 grant was “Hiddenite,” named for a pale green gemstone discovered in the North Carolina mountains in the late 19th century. He plans to orchestrate the music for his bandmates and expand the concept for the piece into a longer show that will premiere in early 2020. “Performing this music with my trio, Twang Darkly, opens up additional space for improvisation and helps push me in directions I might not otherwise consider,” Futreal says. Lauren Smart is a Dallas-based writer and critic. She is on the journalism faculty at Southern Methodist University.